Here’s another modern reworking of a classic, this time George Shearing’s “Conception”. I found this version on Alex Sipiagin’s album Steppin’ Zone, which came out about ten years ago on Criss Cross records. Anyone familiar with the label will recognize the backing band of Chris Potter, Dave Kikoski, and Scott Colley. The real treat here is the commanding presence of drummer Jeff Tain Watts, whose playing on Branford Marsalis’ 1990 European tour inspired young Alex to come to the US. The band rips through the head in just 33 seconds, using the 7/4 time signature to squeeze almost all of the breathing space from the original melody. I played this version live recently, though not at this speed… it’s harder than it looks! 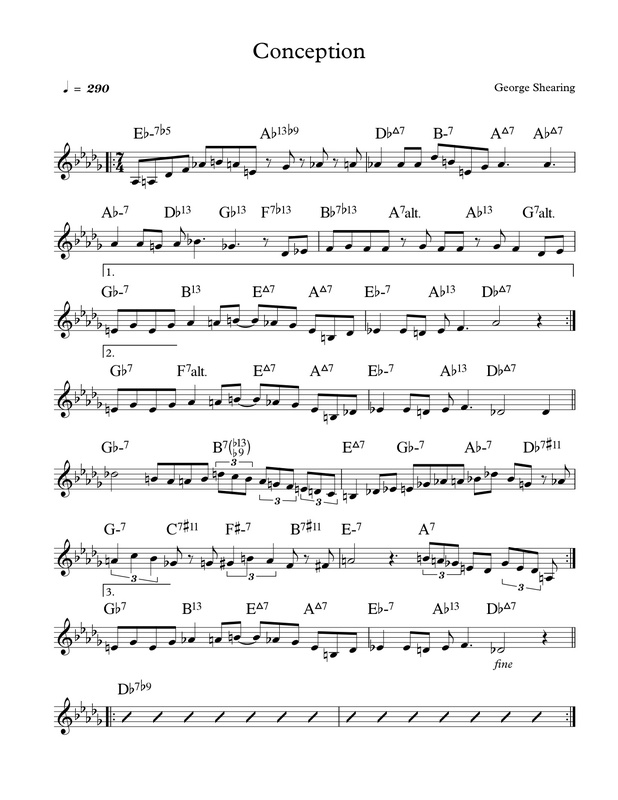 This entry was posted in Uncategorized and tagged 7/4, Alex Sipiagin, Conception, George Shearing, jazz, lead sheet, music, Noteheads, transcription on March 15, 2013 by noteheads.